Advances in digital technology have shifted how people consume media. Today’s audiences expect a convenient, personalized experience. And media and entertainment (M&E) companies are leading the way in embracing the potential of digital to meet this demand. From astonishing innovation and effects in the world of movies and TV, to novel ways of publishing, and new online broadcast models, M&E companies are captivating audiences at every turn. Yet there’s a gap opening up between the way content is produced and distributed, and how consumers want to experience and pay for it. As audiences take greater control of how and when they consume media, their expectations are rising. They want the way they engage with content to match how they live their digital lives—without friction or restriction. And they expect to be able to switch providers easily if they don’t get what they want. Consumers are more demanding than ever. They binge-watch, stream, and consume media on multiple devices, when it suits them. They not only want the best, newest, state-of-the-art digital content—they want it on their terms. A shift within the industry. Convergence is everywhere. The lines between digital, social, and traditional media are blurring. Walls between telecommunications, media, and technology are crumbling. At the same time, both digital native and traditional companies are competing aggressively to create the most compelling original content. Differentiation in a congested marketplace is key. Audiences can only consume so much content in a day, and the need to stand out is more vital than ever before. This ebook looks at the changing appetites among today’s media and entertainment consumers, and explores shifting trends in delivery models. It also examines the impact digital transformation is having on the M&E industry, the challenges posed by media giants, and the tremendous opportunity for those companies that get the digital, direct-to-consumer model right. Media consumption behavior has changed. Once, fans tuned in at specific times to listen to their favorite radio program. People sat together to watch popular TV shows. News, opinions, and features were consumed via newspapers. Music lovers enjoyed compact disc collections. And gaming meant a visit to an arcade. Later, cable and satellite companies locked consumers into contracts. Today, power has shifted to the consumer. In the pay-TV space, for example, we’re seeing record numbers of “cord cutters”—consumers cancelling subscriptions to cable and satellite in favor of over-the-top (OTT) streaming services. While this shift in consumer behavior hasn’t eliminated the need for traditional TV companies just yet, the rate of subscription growth is changing the face of the media market for good. And the effect it’s having on advertising revenues is noticeable. According to a report by the Video Advertising Bureau,1 in 2017 there were more than 14 million US households who only received content via OTT streaming services. This number is growing. Customers now consume what they want, when they want, on any device. Listening to podcasts and audio books, and time shifting—recording and storing programs digitally for playback—are standard practice. Binge-consumption of entertainment is becoming mainstream, especially among millennials and Generation Z consumers. Research from Accenture shows that millennials and Generation Z consumers often watch clips and user-generated content on their phones, and movies on their computers and TVs at the same time.2 For many people, “multiscreening” like this is the norm. Today, consumers demand more for less. They stream songs from Spotify and watch videos on YouTube instead of buying albums and DVDs. They opt for free news on Facebook or Snapchat instead of buying newspapers and weekly magazines. And they source video content through OTT services from the likes of Netflix, Hulu, NFL Network, Sling TV, and DirecTV Now. Changing models for changing consumers. M&E companies now have to be even more creative to meet the demands of today’s consumers, and they’re devising innovative ways to minimize customer attrition. For example, in addition to creating long-form content, they’re now producing snackable content—breaking long-form content up into digestible chunks for different formats. Companies also prompt viewers to share branded content and hashtags, giving their content even greater reach across multiple channels. Phygital—blending physical and digital consumption methods—has been a means for M&E companies, such as print publishers, to survive the digital revolution. Ebooks and online magazines via subscription have enabled them to maintain readership. At the same time, many consumers still own physical media equipment, such as DVD and CD players, so M&E companies are forced to operate these dual supply chains to cater for audiences at every touchpoint. A CD is often accompanied by a free download, for example. There’s also been a resurgence in the desire to own physical media, with 25 percent of 18–24-year-olds having bought a vinyl record in the last year.4 This resurgence suggests that M&E companies will need to maintain their dual supply chain strategy for now. The digital advertiser is here. It’s not just content format that has been forced to change. Advertising has also had to adapt. The rise in time shifting and on-demand media consumption across various platforms, including mobile, has meant that consumers fast-forward through ads. As a result, traditional advertising revenues have transferred to online channels, and are slowly growing. To ensure their traditional advertising revenue doesn’t disappear altogether, M&E companies are innovating with new models. Through its AdSmart platform, Sky has created more than 1,200 audience segments, and delivers different ads during the same TV programming to defined or targeted households. These ads are based on viewers’ demographics, location, shopping habits, and behavior, making media buys more effective. Wherever you look, consumer behavior is evolving, and expectations are rising. And media companies are working hard to be more consumer-centric. They’re not only striving to meet changing consumer demand, but are finding innovative ways to maximize revenue potential. Spearheaded by the music- and print-publishing companies, the M&E industry has largely gone digital. Competition for user engagement and consumer spend is more brutal than ever, and forward-thinking businesses have embraced digital’s potential to distribute more direct and personalized content. In a market where the consumer reigns, content is still king, and it’s seen as a major differentiator in attracting customers. So much so, that M&E companies and telcos are creating their own content. They’re also joining the bidding wars for buying exclusive content alongside the likes of Facebook, Amazon, Apple, Netflix, and Google, creating a heightened climate of competition for traditional players in the marketplace. And there’s greater investment in original content, led by Netflix and Amazon. Content investment has never been so high, with digital native companies leading the charge to build their own, original library, and monetize brand loyalty through subscription models. Traditional companies with high average-revenue-per-user (ARPU) models are giving way to agile, digital native players with a lower entry cost. Their OTT services bypass traditional models, threatening legacy revenues. Despite the growing popularity of industry disruptors, such as Netflix, Apple TV, and Amazon Prime, there’s no room for complacency. The market is becoming increasingly crowded with fierce competitors at every turn, which means the big OTT providers have their own challengers to watch out for. Traditional M&E companies are fighting back. Disney will soon be launching its own streaming services, taking content directly to the consumer and away from disruptors like Netflix. In the UK, terrestrial broadcasters, such as Channel 4, BBC, and ITV are building out their own OTT services. As consumers increasingly choose more-personalized streaming services, so that they can more easily find the content that appeals to them, the M&E marketplace can expect to be more fraught with higher audience fragmentation and churn. With more consumer data available than ever before, M&E companies have been able to adopt fan-based models. Focusing on people’s interests, these provide an enhanced experience and a route to market for specific consumer tastes. Dedicated consumers already enjoy personalized experiences from esports (gaming), and Shudder (streaming horror films for a monthly subscription). Engaging higher-value fans helps differentiate the content offering by bringing together influential consumers that share passions and interests—and pay more for the privilege. There are 130 million different versions of Netflix—one version per subscriber—a level of personalization that’s driven by the platform’s recommendation algorithm. Demand for innovation to deliver such personalized user experiences is high. To succeed, content producers and distributors are investing in emerging technologies that have the hyperconnected consumer in mind. Newly converged groups and digital native companies alike are striving to enable seamless and simplified buying journeys across products and bundles. Huge challenges exist with compliance, piracy, and rights infringement. Regulations around customer protection (e.g., GDPR), licenses, and advertising are reshaping the M&E landscape. Although it’s set to become more of a challenge for digital native companies, Facebook, Amazon, Apple, Netflix, and Google are currently exempt from the customer protections, licenses, and frameworks around advertising choices being enforced by regulatory bodies, such as Ofcom. However, bodies such as the EU and local regulators have started to enforce rules for digital native players. Piracy continues to erode revenue across the broadly unregulated rights ecosystem. By 2022, it’s predicted that piracy will cost the M&E industry US$51.6 billion.7 Streaming piracy is becoming more prevalent and sophisticated. Today, entire catalogs, not just single films or one-off events, are at risk. Compliance with privacy laws is critical for traditional M&E companies, especially those looking to build trust with digital consumers. Recommendations and personalization are key enablers of growth, so privacy must be addressed. While consumers demand personalized experiences, it’s been found that a lot of personalization features are not presented transparently to the consumer. This is all set to change, as regulations, such as GDPR, ensure M&E companies must seek permission to use their customers’ data, or risk huge financial penalties. For both M&E companies and consumers, data security has become paramount. Advertisers and publishers are reassessing their relationships with the digital giants after revelations around measurement errors, brand-safety scandals, and irresponsible sharing of news and content. However, emerging technologies, such as blockchain and smart contracts, promise to provide accuracy and transparency in rights and royalty management. Technology like this can enable crowd peer-review models to combat fake news, for example. In addition, both person-to-person sharing and micropricing can help monetize and secure content rights. Facebook, Apple, Amazon, Netflix, and Google themselves are innovating as they try new ways of reassuring consumers that they can be trusted with their data. For example, according to Pew Research, one in four Americans has deleted their Facebook account in the last year because of data-sharing challenges.9 To mitigate these risks, Facebook has addressed privacy concerns and adjusted the way its algorithm works to protect its users and avoid spreading false news. Convergence is everywhere. To respond to the demands of continuing market transformation, the once clearly defined lines between industries and media are blurring. And companies must now utilize a flexible infrastructure that’s fit for any future. Telecommunications companies are consolidating their position in M&E (Verizon acquired Yahoo, AT&T scooped up Time Warner). Media companies continue to expand across the value chain (Disney is acquiring 21st Century Fox, Comcast recently won the battle to acquire Sky). Marketing agencies and digital businesses are buying traditional publishers. For example, the New York Times bought agencies HelloSociety and FakeLove, and the Financial Times took over content marketers Alpha Grid. And with traditional media brands eroding, companies are using mergers and acquisitions, to not only get closer to their customers, but as a means of fighting off the competition and creating differentiation. For example, Sky in Europe and Netflix are creating mutually beneficial, consumer-centric partnerships—all in the name of entertainment, freedom of access, and better, more-unified experiences. Consumer expectations are rising, and the need to meet demand while opening up new revenue streams is driving innovation. M&E companies are trailblazers when it comes to finding ways to enhance experiences. Digital special effects and 3D movies are firing imaginations. Content companies are capitalizing on emerging technologies, such as augmented reality (AR), virtual reality (VR), and artificial intelligence (AI). This delivers more immersive consumer experiences and provides M&E companies with a competitive advantage. Game publishers have popularized AR and VR with games like Pokémon Go. VR is expanding beyond gaming into areas such as esports. The gaming industry is also capitalizing on the use of emerging technology. The University of Falmouth has created an AI algorithm that can imagine video games from scratch—exploring a space, identifying things that are potentially interesting, and then presenting them to a designer to follow up on. This could make the gaming industry more profitable by drastically reducing design and development times. To build lasting customer relationships, however, traditional and digital native M&E companies must innovate and transform distribution models and user experience as well as content. M&E companies are increasingly embracing the technologies, processes, and innovations they need to do this. A whole new set of experiences. Away from content production, AI chatbots, voice services, and live video support are making simpler self-service a reality. Dish in the US, and Sky and YouView in the UK, have adopted voice for search and transactions. Amazon Kindle has the live-experience mayday button. AI and Internet of Things (IoT) are promising connected, value-added services in the home—security checks or appliance management over the set-top box, for example. Companies are enjoying efficiencies in self-installation and remote maintenance. Finally, AI and IoT are poised to revolutionize in-car entertainment and drive media consumption in autonomous vehicles. AI is giving employees access to information they need for work, such as the BBC chatbot, which is being piloted to help retrieve ratings and audience analysis. In digital supply chains, AI is automating resource-hungry processes, such as metadata indexing or compliance monitoring. This is all part of a move towards a modern digital workplace for employees, who expect a more seamless work experience, similar to the way they live life every day. Creating a modern digital workplace in the cloud will also enable finance departments and HR to predict customer demand and impact, so that they can scale as required. This will enable M&E companies to become leaner and more agile when launching new products or considering new partnerships or mergers. To embrace innovative, global value propositions, such as streaming services, M&E companies are adopting cloud. Only cloud-based business models provide the increased agility needed to keep up with today’s demand for digital. As a leader in cloud technology, Oracle partners with M&E companies of all types and scale, offering a broad portfolio of scalable, media-specific cloud offerings. With high-performance, enterprise-grade media archiving, storage, and subscription solutions, driven by AI and self-service. Only cloud provides the flexibility companies need to respond to changing market influences and to innovate for consumers. It enables them to react quickly to changes in other sectors (think in-transit entertainment in self-driving cars), and to launch new products quickly, at scale, across more channels and devices, and at lower cost. Cloud allows businesses to collaborate more securely and more efficiently across organizations and regions. Transformational technologies, such as AI, IoT, and blockchain, are increasingly being embedded into it, enabling innovation. And expandability—increasing or decreasing storage and access to content according to business requirements—is trouble-free in the cloud, with minimal overhead. Cloud makes it simple for M&E companies to offer consumer-centric value propositions, including OTT and streaming. Security checks, servicing, and maintenance can be provided through a digital home gateway, such as a set-top-box. Modern digital customer experience platforms enable a 360-degree view of every customer. As a result, brands can engage at every touchpoint—across marketing, commerce, and service—to orchestrate a seamless customer experience, and potentially personalize journeys from acquisition to sales and support. Cloud technology helps M&E businesses realize revenue from data like never before. They’re now able to decipher and build valuable customer DNA from first- and third-party data sources. They can act on enriched data by exposing the right insights at the right time throughout the organization. And they can maximize the efficiency of campaigns through innovative, personalized advertising, such as close targeting and tailored offers. Access to 360-degree data means they can anticipate customer decisions, apply content recommendations, and improve search and retention. For example, Sky uses connected data to better understand consumers who are thinking of ending their subscriptions so that they can offer them more appropriate services. Making work smooth and agile. Revenue is tight. Talent is expensive. And, for M&E companies, business efficiency is essential to growth. Cloud is helping companies optimize and streamline their business processes through agile financial management, planning, and operations. Savings can be introduced relatively simply. Businesses can streamline digital workflows from content acquisition to publication, eliminate digital islands, and drive automation. Media companies can take advantage of IoT to reduce pressure on servicing by introducing self-installation, issue monitoring, and anomaly detection through the set-top box, for example. Entertainment businesses with large production facilities and heavy resources can reduce logistical risk and improve content creation. With cloud, they can provide a reactive, connected, on-the-road experience for crews, and assemble teams quickly and easily. Internally, cloud technologies can help to attract, manage, retain, and nurture the best talent by providing an all-digital, employee-centric workplace. Cloud drives innovation. Companies can more-easily support the growth of new propositions, personalize offerings, and enhance on-screen value to viewers when they’re anchored in the cloud. In the world of movies and TV, cloud-based, machine learning algorithms can develop film concepts, trailers, and ads. As a result, production becomes faster and more efficient. And cloud helps build silo-free businesses that can readily adopt new delivery mechanisms and revenue models to enhance agility, and streamline mergers and acquisitions. Using Oracle Storage Cloud, Tippett Studio reduced content retrieval from many days to less than four hours, yielding a tenfold reduction in total cost of ownership compared to competitive IaaS providers. Despite their ability to redefine themselves with the latest technology, M&E companies are facing significant challenges. Changing consumer habits, high expectations, and market saturation mean companies are being forced to provide increasingly competitive content and seamless experiences. OTT business models are putting pressure on advertising revenue streams, with traditional media providers being hit hard. Evolving regulatory frameworks are changing the goal posts for data use and privacy. Agile, digital native companies will survive and thrive. Others will have a harder job of responding to demands, particularly those with cumbersome, legacy infrastructures and inflexible business models. But, M&E companies are embracing technology and looking for new ways to entertain and delight us. Many have adopted cloud-based business and production models, and are gaining benefits in the form of scalability, and ability to enable innovation. One thing is constant: People everywhere love being entertained, so the market remains strong. For the M&E industry, the show must—and will—go on. Media and entertainment is in the midst of one of the most significant industry mega shifts we have ever seen. The changes throughout the whole media ecosystem are moving so quickly, it’s hard to stay on top of all the trends. But we can keep you abreast of the critical information as it changes. Recently, we’ve seen convergence continue to drive exponential change across the entire media ecosystem. These changes are creating new growth opportunities as industries that traditionally did not operate in the space are reshaped and realigned. Learn more in PwC’s “Perspectives from the Global Entertainment & Media Outlook 2018–2022: Convergence, Connections, and Trust”. Consumer consumption behavior is driving transformation. Most know that consumer media consumption behavior is the change agent driving transformation across the whole digital media ecosystem. It’s even shifting industry economics to new business models. 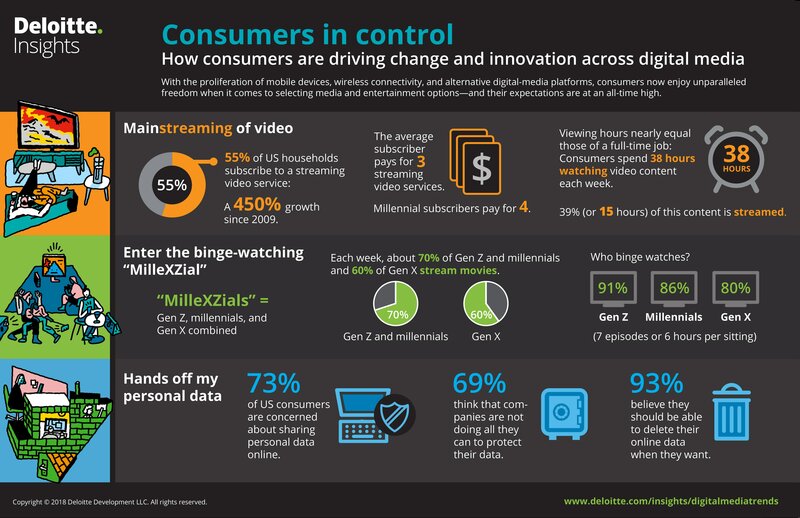 See more in Deloitte’s infographic “Consumers in Control”. Blockchain and the future of media supply chain. With the ability to share a single, immutable set of records, blockchain could be revolutionary for the media and entertainment industry. It could help transform a number of areas from content distribution to advertising, and provide greater transparency. Learn more in Accenture’s report: “Blockchain: Re-engineering the Media Value Chain”. What are the latest trends in the media and entertainment industry? How are ratings affecting the print and publishing, radio, and television sectors? See what’s happening with advertising revenues and what it means for the overall growth of the industry. And learn more about the transformation of the media ecosystem and its changing economics in S&P Global Ratings’ “Industry Top Trends 2018: Media and Entertainment”. Transforming business operations to support growth in broadcast. US-based Sinclair Broadcast Group owns and operates TV stations and has affiliations with all the major networks; delivering broadcast content via multiple-platforms, including over-the-air, multichannel video program distributors, and digital platforms. Sinclair’s vision is to connect people and content everywhere. As a pureplay broadcast player, Sinclair needed to transform their HR and finance functions to continue to support their rapid growth. Read this Forbes article on how content creation experts SIM International selected Oracle Financial Cloud as their single finance platform. And find out how they can now manage their own business like never before. Helping SiriusXM transform the radio industry through subscription. SiriusXM is one of the world’s largest audio entertainment companies and is among the largest subscription media companies in the US with more than 32.7 million subscribers. It has revolutionized in-car entertainment, offering more than 140 channels, including commercial-free music, plus sports, talk, comedy, and news. At the heart of the SiriusXM business model is how it uses IoT and machine learning technology to convert trial consumers and manage the entire subscription lifecycle. Breaking new ground with AI. Since 2002, the Mutua Madrid Open has strived to be the most innovative tournament on the circuit by using new technologies to provide a unique user experience for its spectators. With this challenge in mind, the company decided to implement a chatbot developed with Oracle Cloud Platform to provide constant updates about the event to fans.